This stylish down Down Sweater Hoody will keep your little one toasty warm. The sweet pattern reverses to a solid, giving you two jackets in one! Keep them warm with the Baby Reversible Down Sweater Hoody. It has a lightweight, windproof polyester plain-weave print shell with high tear-strength and a DWR (durable water repellent) finish; it reverses to a contrasting solid made of polyester mini-ripstop fabric. 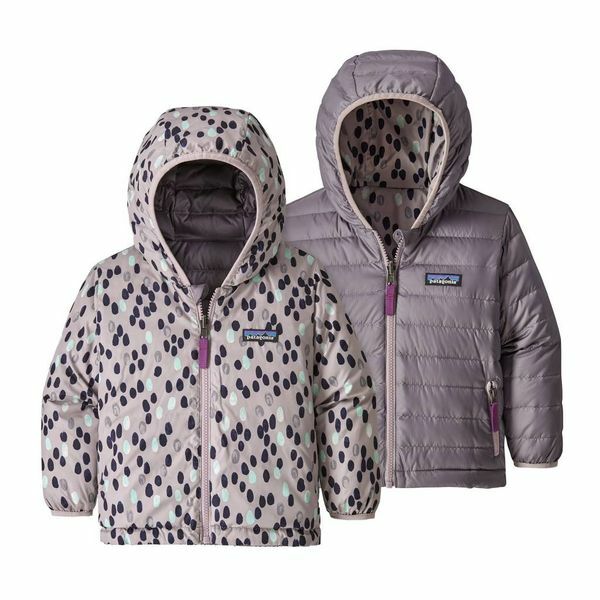 Insulated with 600-fill-power 100% Recycled Down (duck and goose down reclaimed from down products) for compressible warmth; quilt-through construction keeps down from shifting. It has a three-panel hood for stay-put fit and a full-length center-front zipper with no-chafe garage and a reflective webbing pull. Zippered handwarmer pockets on solid side; on-seam pockets on print side. Spandex binding at hood and cuffs plus a partially elasticized hem retain warmth. Print shell: 2.2-oz 100% polyester plain weave. Solid lining: 1.6-oz 30-denier 100% recycled polyester mini-ripstop.